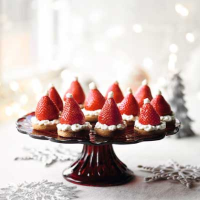 These sweet strawberry canapés will add a bit of humour to Christmas drink's parties and celebratory meals. 1. Preheat the oven to 170ºC, gas mark 3 and line 2 baking sheets with baking parchment. Place the flour, a pinch of salt, baking powder, spices, butter and sugar into a food processor. Blitz briefly. Whisk the egg and honey together in a separate bowl, then with the motor running on the food processor, slowly trickle in the egg mixture to make a firm dough – you might not need it all. 2. On a work surface dusted with flour, roll out the dough to about 5mm thick, then use a 4cm cutter to stamp out 24 rounds. Any leftover dough can be frozen. 3. Arrange the rounds on the baking sheets and cook for about 15-20 minutes or until slightly darker in colour. Cool on a wire rack. 4. Slice the top from each strawberry to leave a flat base. Using a piping bag with a small 0.5cm round nozzle, pipe a dot of cream into the centre of each cooled biscuit and top with a strawberry. Pipe around the base of each strawberry and finish with a small dot of cream on the pointed top to make a bobble for Santa’s hat. Serve immediately. Protein: 1.2g A serving is one Santa's hat. This recipe was first published in Wed Oct 02 14:35:00 BST 2013.